11th SKDUN World Kohai Cup. 10 -11 October 2018, course open to all grades, detailed schedule to follow. Chisinau International Airport is the nearest one located approximately 15 km from Chisinau. Transfer from Airport to the accommodating hotel will be organized by the Organizing Committee or our partner “Condor Tourism”. You need to contact us or our partner “Condor Tourism” via e-mail: [email protected], providing them with details of your flights for arrival and departure – date and time, airline and flight number, number of people to be transported. Cost of the transfer will be 7 EUR per person transfer from airport and 7 EUR per person transfer to airport. Transport minimum 3 people. Transfers for SKDUN Board members will be free. At the airport you will find a contact person who will accompany you to the Hotel or Sport Hall to make the registration. For Accommodations you will need to contact the Organizing Committee. You will receive a separate list with information about hotels. Participants who need a visa must contact the Organizing Committee as soon as possible, time delays may result in your visa not being granted in time for the event. This is your responsibility. – 1st, 2nd and 3rd places – Trophy, medals and diplomas for all team members. Note: Late registrations will be permitted at the organisers discretion. and +25 Euro for team events. The final event on Sunday will be the prestigious Masters competition. 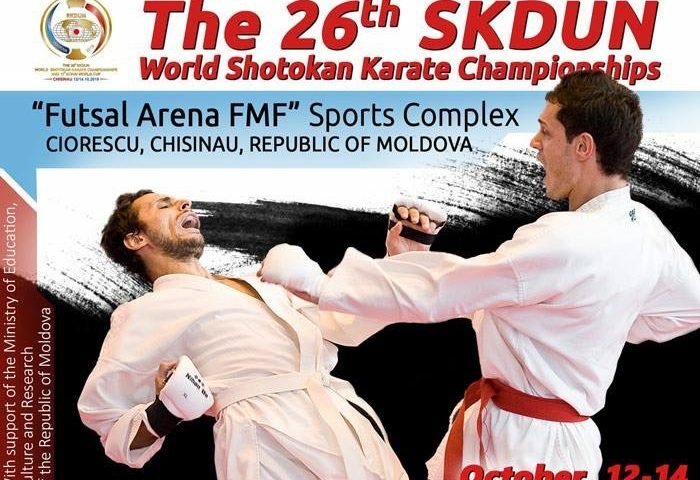 Each country can nominate one Female and one Male competitor over 18 years of age that will compete in Kata and Kumite for the ultimate title of Grand Champion. Nominations to be submitted on Saturday evening. Kata rules: All rounds by points system (Tensu hoshiki). 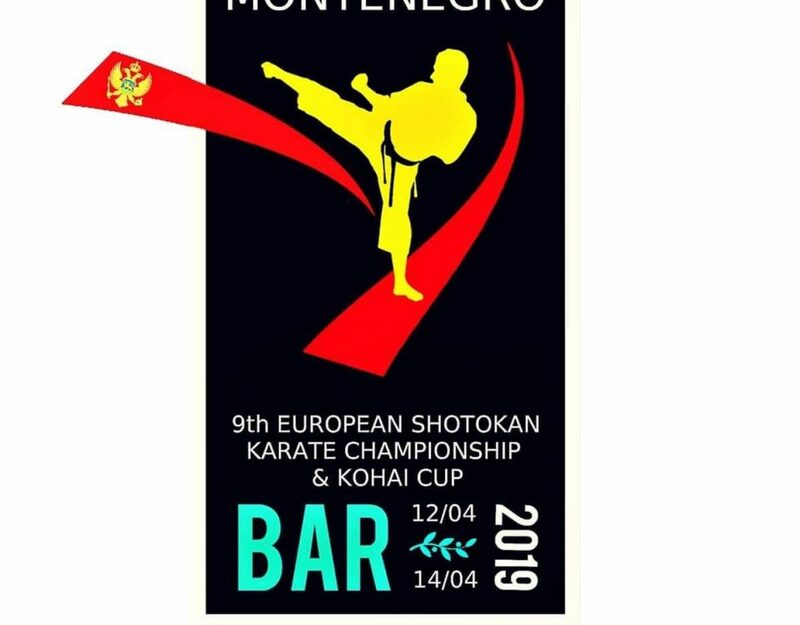 Limit of participation: Max of 6 competitors per country per category (Exception: Children and Minicadets are alowed 10 competitors per country per category and Cadets: 8 competitors). The organising country can register one more competitor in each category. The competitors in each category will compete in the elimination rounds down to 8 competitors (two competitors at the same time, AKA / SHIRO). In semi-finals, these 8 competitors will perform Tokui kata (their choice from the approved list), then 4 competitors with the highest scores will perform a different Tokui kata in the final round (for 1st, 2nd and 3rd medal place). In the case of a draw in the semi-final and final rounds, competitors must perform a different kata to the ones performed in all previous rounds. For choice of Tokui kata see the approved kata list appropriate to the competitors range ( it can be found in the SKDUN rule book on the SKDUN website). In the case of a draw, teams must perform a different kata to the ones performed in previous rounds. Limit of participation: Max of 2 teams per country are accepted in each category. The Tokui kata must be selected from the approved list and be appropriate for the lowest grade in the team. For choice of Tokui kata see the approved kata list and competitors range (you will find it in the SKDUN rule book). Kumite rules: Ippon Shobu (2 waza-ari or 1 Ippon) for all categories, except seniors individual kumite finals – Sanbon Shobu. Duration of the match is specified for each age group. Jiyu Ippon Kumite rules: The criteria for judgment will be the same as for jiyu kumite, but no scores or penalties will be awarded during the match. The match will comprise of 6 attacks: jodan-zuki, chudan-zuki, mae-geri chudan, yoko-geri kekomi chudan, mawashi-geri chudan or jodan (must state the target), ushiro-geri chudan. The defender will block and counter using go-no-sen (any block and counter/counter combination). Each attack will be done by aka then shiro i.e. aka jodan-zuki, shiro blocks, then shiro jodan-zuki, aka blocks etc. The decision will be made by Hantei at the end of the match. Competitors who compete in Jiyu Ippon Kumite can also participate in Jiyu Kumite (Ippon Shobu). Veterans can also participate in Seniors events (Individual or teams). KUMITE TEAMS (Limit of participation: 2 teams per country in each team kumite category). Kumite teams may include one 5th kyu or 4th kyu (blue/purple belt). 094. Male Open Jiyu Ippon Kumite. 095. Female Open Jiyu Ippon Kumite. Kata rules: Elimination rounds by flag system (kohaku hoshiki). The competitors in each category will compete in one elimination round down to 8 competitors (two competitors at the same time, AKA / SHIRO). Kata chosen by referee. In the case of draw, competitors must perform a different kata to the one performed in the previous round. Final round by point system (tensu hoshiki), the 8 competitors will perform Tokui kata (their choice from the approved list), top 3 scores will decide 1st, 2nd and 3rd medal place. No limit of participation. In case of large number of participants in any category they may be divided into further categories by grade. These new categories will be announced at the event. (In the case of a draw, competitors may perform the same kata). 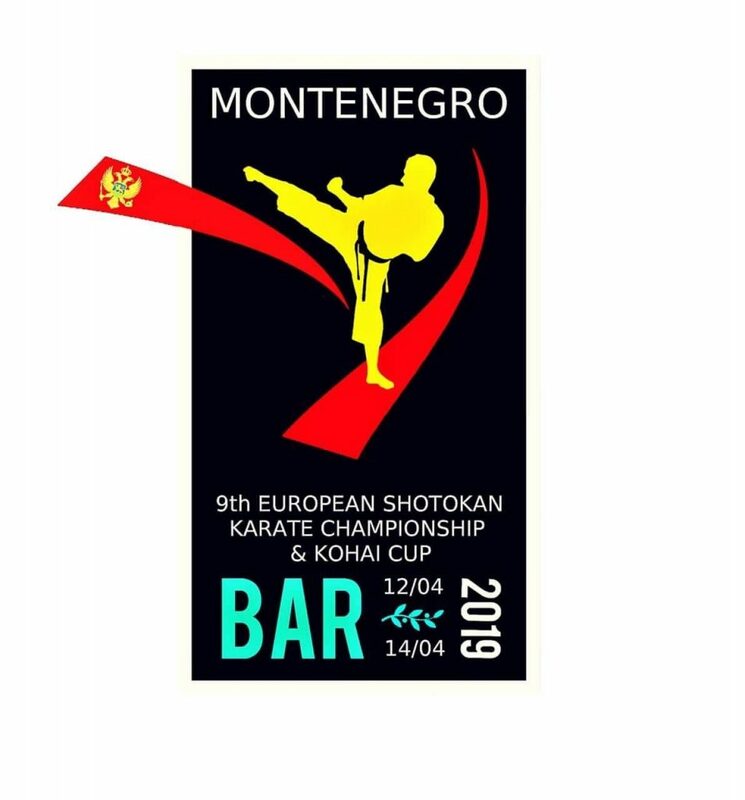 Categories for 6th to 4th kyu: Elimination rounds – Sentei kata: Heian Shodan, Heian Nidan, Heian Sandan Final round (top 8 competitors) – Tokui kata: Choice from all Heian kata plus Tekki Shodan. (In the case of a draw, competitors must perform a different kata than in the previous rounds). All rounds by point system (Tensu hoshiki). Elimination rounds – Tokui kata; Final round (4 teams) – different Tokui kata. In the case of a draw, they can repeat kata. No limit of participation. KOHAI 028. Kata team male KOHAI 029. Kata team female KOHAI 030. Kata team mixed Cadet team Kohai may include one competitor from children category (8-11 years old), but not brown belt. Jiyu Ippon kumite – will be judged by hantei (majority vote by flag system). The criteria for decision will be the same as for Jiyu kumite, but no scores or penalties will be awarded during the match. Each match will comprise 3 attacks: jodan-zuki, chudan-zuki, mae-geri chudan. The defender will perform an effective block and one counter technique only. Aka attacks first with jodan-zuki, then shiro attack with jodan-zuki, then aka attacks with chudan-zuki, etc. 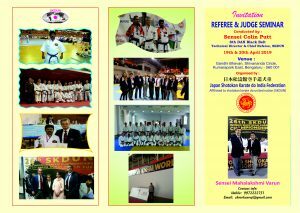 Competitors who compete in Jiyu Ippon Kumite can also participate in Sanbon kumite. Duration of the match is specified for each age group. No limit of participation. The categories may be further divided in case there is a large number of participants. The new categories would be announced on the day. KOHAI 041. Boys 6 – 4 kyu Jiyu Ippon kumite. KOHAI 063. Male Open Jiyu Ippon Kumite. KOHAI 064. Male Open Jiyu Ippon Kumite. KOHAI 062. Female Open Jiyu Ippon Kumite. KOHAI 063. Female Open Jiyu Ippon Kumite. KOHAI 065. Female Open Jiyu Ippon Kumite.